Arriving in Almhult, Sweden to an empty apartment demanded a lot of quick purchases to turn this empty apartment into a cozy home. At first, we were only aware of IKEA, the behemoth company of Almhult; but later, we started hearing about loppis, which roughly means used/second-hand. This post will attempt to outline the two primary furnishing options here in Almhult so that you too will know, just in case you end up arriving to an empty apartment with a jet-lagged family in need of both sleep and a home. IKEA: Almhult is a company town and IKEA is that company. Ingvar Kamprad started his now famous furniture business in 1943 with his first permanent store opening in 1953, which happens to be the store I found myself in within 4 hours of arrival to this small town. The IKEA store is one of the few things here that ironically enough reminds me of the States. 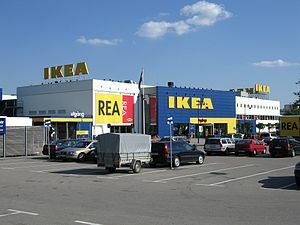 A large warehouse-like blue building with blazon yellow highlights (the colors of Sweden) set in front of a massive parking lot, has an unfortunate resemblance to any Wal-Mart State-side. However, upon entering IKEA, and similarity to Wal-Mart ends. The interior designers for IKEA are very talented, both in creating the minimalist Swedish furniture as well as setting an atmosphere geared for home decorating indulgence. Similar to entering a real home, IKEA has a short entrance area, nothing spectacular, but with a few examples of their products. More importantly, the entrance provides the transition from your life on the outside to the potential life you could have on the inside. Once through the entrance tunnel, you find yourself walking through a diverse array of inviting and comfortable living room designs. If you so wanted, you could purchase a pre-designed complete living room arrangement then and there; but, for most folks the real appeal comes in the fact that you are also provided access to all of the raw ingredients for that room and are encouraged to design your own. As I have come to discover, Sweden seems to be really big into the “Do It Yourself” (DIY) mentality, which is in part how IKEA has thrived. While some master designers have laid out multiple options for every room in your home, IKEA really offers you the possibility to harness that inner amateur designer of yours to create your own (semi) unique home. Especially when the expectation is that you will have to assemble any furniture you do purchase by yourself; after you have found it in the warrens of basement level warehouses, loaded it and carted it home by yourself as well. From here, it is a constant movement down through more kitchen supplies, curtains, carpets, bedding, bath, and finally garden. If you liked something from the display floors, you are now in the warehouse section and it is a fun scavenger hunt for find the flat-packs of whatever it is you desire. At this store, there is also a bonus “basement” section where anything from the display floor, photo shoot for the catalogue, or returned and damaged items are all available for a deep discount. Within 6 hours of being in Almhult, we had selected and purchased a bed for the master bedroom, one for K, a large couch for the living room, and a minimalist supply of pots and pans and plates and bowels. As our rental car was too small to transport most of it, we had to pay IKEA 300SEK to deliver it to our apartment the next week. It wasn’t until a week after arriving, and a few more IKEA trips later, that someone told us about loppis, and in particular that every Saturday morning there is a huge Second Hand store at the Steno aluminum factory. This is particularly humorous as earlier that week S and I were walking past said factory and were cracking jokes at the large “SECOND HAND” sign on the factory; cause everyone could really use some more second hand aluminum. So, we decided to check it out. Loppis (Second Hand @ Steno Aluminum Factory): Forget IKEA’s manicured procession way of meticulously designed Swedish minimalist rooms for your dream home; we are talking about cutthroat, no-holds barred, cage match of scuffed, beat-up, and a bit worn selection of good deals. Everything from kids toys and clothes, couches and dining room sets, to lamps and china for the kitchen. The warehouse, an old industrial warehouse to boot, seems to be the Saturday morning place to be. Perhaps it is the uniqueness and essentially non-IKEA-ness of the place that brings them in; but it opens at 9am and we were considered late arrivals at 9:30. The place was packed!! And for good reason, immediately I found an awesome brown leather retro 1960s captain’s chair for a mere 75SEK (approximately $12). The following week, S found a very unique hexagonal red leather, with worn wooden legs, footstool that has become the perfect accent piece in our living room. Nearly everything in this place is full of character and I am sure they have a lot of stories to tell. We also happened to find the perfect dining room table and chairs. A scuffed up worn wooden table with matching chairs that have brown plaid cushioned seats. The table exudes rustic country charm and looks like it has been serving families wholesome meals of meatballs and potatoes for generations. K now goes with 20SEKs and never fails to find two to three toys that are perfect for his burgeoning collection. They also serve simple and classic Kaffe & Ficka (coffee & snacks – usually pastries). The store, as every other store in Almhult (except IKEA), closes at 1pm, so get there early and find the perfect deal of old Swedish charm for you. And don’t worry; anything you purchase can be delivered to you on Monday for 100SEK. In addition to the factory store, during the summer months there are multiple private loppises around town, much like the traditional yard/garage sale that I am used to in the States. Often, multiple families and households will host one together. IKEA – Points For: good selection, covers nearly all of your Home & Garden needs, simple enough for everyone to use, open everyday, and good cafeteria. Points Against: without a car, hard to transport larger items home without paying 300SEK, not so unique, you are bound to see your curtain or chair or plates at a number of your friends and neighbors homes. Second Hand Loppis @ Steno – Points For: good deals, charming old furniture, unique items, community feel, and cheap delivery. Points Against: a bit too cutthroat, cash only, limited selection, only on Saturday morning. Well, this has been long, but if you are finding yourself newly located in Almhult and in need to furnishing your home, I hope this helped.